Apple has lost a legal attempt to ban French protestors from demonstrating in its main Paris store. 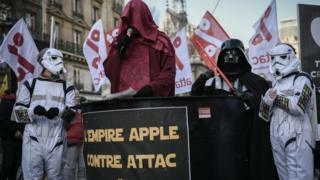 Tax campaign group Attac has put on protests at Apple shops in Paris and Aix-en-Provence, claiming the firm had tried to avoid paying the tax it owed. Apple sought a ban on protestors, saying the demonstrations risked the safety of customers and employees. Apple sought an injunction banning the group after protests last year at its flagship Paris store that involved slogans being painted on shop windows, a conga line and a sit-in. The electronics firm said there was a risk of "imminent damage" from the protests. The Paris court denied the injunction saying there was no evidence for this after the Paris protest. It also threw out Apple's call to fine the activists €150,000 (£131,000) and impose damages if they protested again. "The court has recognised the legitimacy of our actions and went as far as to say we behaved in the general interest," Attac spokesman Raphael Pradeau told French news site The Local. Attac said it planned to keep on organising demonstrations in shops. The electronics giant, like many other tech firms, has been criticised recently for not meeting all of its tax obligations. In 2016, the European Commission ordered Apple to pay €13bn in unpaid taxes. The Commission called on Republic of Ireland, where Apple's European subsidiary is based, to recover the cash. Ireland disputed the demand and has lodged an application to dismiss the Commission's order. While the case is decided the cash will be put in an escrow account.